Bongers are a great tool for percussive massages. As implied in the name, Bongers lightly tap or “bong” the patient for a soothing massage. Using the Bongers is both fun to do and easy to use. Bongers feature long, ergonomic handles with adjustable straps for better reachability, reduced hand fatigue and improved grip. 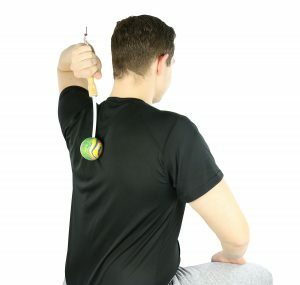 When the soft ball on the tip to tapped down on the area of treatment muscle tension can be relaxed and blood flow is stimulated. The resulting increase in blood circulation can also help to increase the person’s recovery rate and help with stiffness. Most people store tension in their neck and shoulders, and that’s usually where Bongers are most effective. There are a variety of different tools that can be used to practice percussive massages. With Bongers you gain a unique tool that’s as fun and easy to use for the user as it is for the patient. If you don’t want to rely on others, Bongers can also be used on yourself. Simply move your wrists in an up and down motion on the affected area and Bongers will do all the work. This massage tool comes in three different colors (blue, purple and cosmic) so you can pick one that suits your personal preference. To see if the Bongers massage tool is right for you, please consult your doctor before use. For more information on Bongers, click here.